I bought a new android phone, and the last phone is iOS system. Is there a method to transfer the pictures on iPhone to my new one? If possible, I want to burn this pictures to DVD. Maybe I could play the pictures on TV? You can use ApowerTrans to transfer pictures from iPhone to Android phone. It's easy to operate. I know you can transfer your pictures from iPhone to Android with the help of phone transfer program. But to burn them to dvd, you need to move them to pc. Then use media player to help you do that. Is your new android phone a Huawei or Honor device? 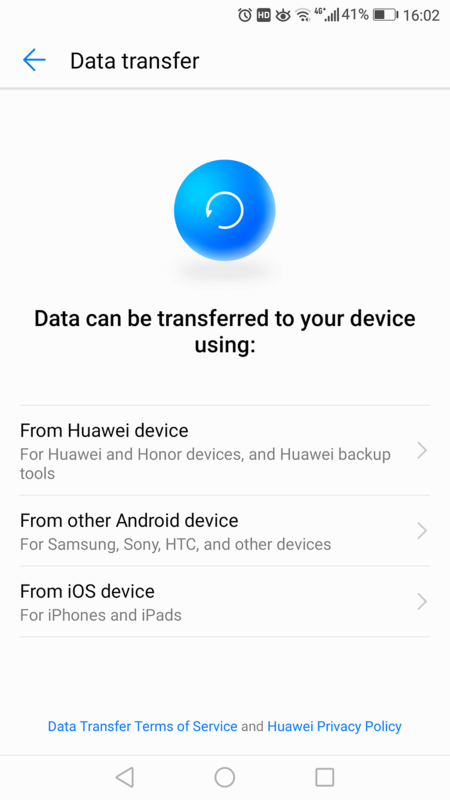 For my Huawei phone, in Settings - Advanced settings, there is a stock utility, Data transfer. The screenshot I just took is as below. FYI. I think it is great. Hello, friend please try tools version 3.O. It is a file transferring and sharing tool which is used for iDevices such iPhone, iPod, iPad. It supports both Android and iOS platforms. So give it a try. In addition to that, you can have so many features related to data. Hello Stephanie, You can do this with easy simple three steps. Get google drive into your IOS device. Then you can easily back up all your content. If you are wishing to backup photos then navigate to Menu > settings > Backup photos and videos. Then easily get your new Android device and sig into your google drive. That's all. Hope this will help you. Most users choose to plug the iPhone and Android phone in the PC or Mac and drag the images from iPhone to the computer via iTunes. Then, drop them to the new Android device directly. This is a workable, but not convenient. Coolmuster Mobile Transfer, an almighty and easy-to-use data transferring tool, helps you transfer photos.The whole photos transfer process can be finished within 3 simple steps, along with several mouse clicks. With Mobile Phone Data Transfer, you can transfer various types of files between Android and iPhone easily, and the transferring process will be protected by the technology, so that here is no quality losing, no personal info leaking out. maybe you can buy a new one. you can put your picture into the computer, burn them to DVD disc. If so that , i am wondering how to transfer pictures from iphone to Android ? and how to transfer them from Android to computer ? only after you have done that , you are allowed to burn them to DVD disc on computer . Once you transfer photos to android, set up your Google account. The pictures you transferred can be backed up to Google Photos (and will continue to back up to cloud to save space on phone). Then go to Google Photos, arrange your photos into albums if you like, or not, but you have the option to then download photos to your PC. Once your Google Photos are on your PC, burn them to a DVD. Plu facile mon ami.